You already have a congested roadway, and the transportation planners predict even more traffic on that road in the near future. What do you do? For most of the last century, the answer was to increase capacity. In the short-term, this seemed to work. Time and time again, over the long-term, the actual amount of traffic after the capacity increase grew far more than expected. What seemed like an obvious solution to a congestion problem continued to disappoint. But why? The reason for these failures lies with the principle of induced demand. Once capacity increases, not only do you get the originally predicted traffic growth, but you also facilitate some often unanticipated changes in travel behavior. First, existing road users might change the time of day when they travel; instead of leaving at 5 AM to beat traffic, the newly widened road entices them to leave for work with everyone else. Second, those traveling a different route might switch and drive along the newly widened option. Third, those previously using other modes such as transit, walking, bicycling, or even carpooling may now decide to drive or drive alone instead. Together, these unwanted behavior changes fall under what is termed the theory of triple convergence (also known as the ‘Iron Law of Congestion’). This latent demand induces more traffic than originally expected and saps the supposed improvement of the expected benefits. The joke is that adding lanes to cure congestion is like loosening your belt to cure obesity. Empirical results over the last century – due to the principle of induced demand – have borne out that this issue is real and should always be accounted for when considering adding capacity as a solution to congestion. Downs, A. (2004). Still Stuck in Traffic. Washington DC, Brookings Institute. But it’s not really “induced” – it was there already, just hidden. “Latent demand” is a much more accurate term. And it goes both ways: one frequently sees high-frequency, reliable transit service (rail/BRT) get far more riders than slow, infrequent, mixed-traffic buses. That too is latent (or induced) demand. People who previously drove or stayed home start taking the train. 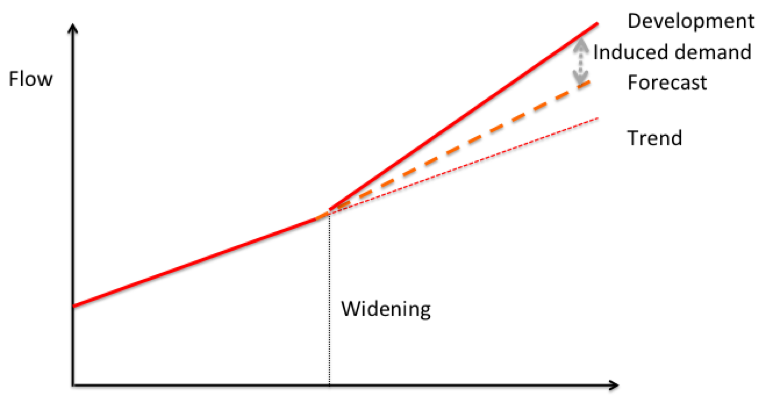 Generally, latent demand explains why road widening won’t necessarily reduce congestion or pollutant emissions. But it doesn’t mean that mobility won’t increase at all. It’s not a complete answer to a highway widening project – it’s simply a point that may suggest that spending scarce infrastructure dollars on highway widening will have fewer benefits than spending that money on a new light rail line. Rationing supply does not reduce demand in economic terms. It only introduces inefficiency and reduces public welfare. There are many examples where capacity was built that was never filled. New toll roads frequently suffer this problem, as do new airports, rail transit systems, etc. Spain famously overbuilt its transportation infrastructure in the 1990s and early 2000s. They failed to induce demand. I suggest that we put less faith in current models rather than claim peoples behavior is wrong or irrational. As David has noted a number of times in posts, when events such as the collapse of the I-35W bridge occur, it raises travel costs (time and congestion on alternate routes), and a significant number of trips simply disappear. Demand is still the same, but the number of trips is reduced. Induced demand is the flip side of this. Decrease costs enough and more trips are generated. It is a sign of success that more trips are served. But, that doesn’t mean that the success of one project does not cause new challenges.